Our partnerships with technology solution providers give you additional tools to expand your CRM capabilities, giving your business productive and efficient workflows. We are here to help. If you have questions about your specific business needs, contact us and and we will find the solution that’s right for you. AddonSoftware® is an Enterprise Resource Planning (ERP) business solution with a core set of accounting, distribution, and manufacturing bundles. Customers of all sizes have a choice of running AddonSoftware on premise or online in a cloud environment –one solution and one technology set for both options. AddonSoftware is developed by BASIS International Ltd., and is headquartered in Albuquerque, New Mexico USA. IntelliRep allows call reporting from within emails sent to either internal or external sales reps and then manages the follow-up process via automated email messaging. All follow-up activity is added to the GoldMine history of the company initiating the lead and leads are automatically prepared from a GM+ View with no additional data entry required. Synchronize GoldMine to Google, Outlook 365, and DejaOffice CRM for Android and iPhone. The best way to carry your GoldMine, add new Contacts, Events and Notes. $129.95 per user. Free from the App Store – A mobile CRM App with Linked Contacts, Appointment Completion, Notes and Histories. Server based solution for the home office, synchronize GoldMine to Google and DejaCloud for multiple users. $749.95 for 5-users. CRM for mobile allows you to interact with your device by making it possible for you to contact prospects and customers while on the go. wMobile offers both a mobile and desktop user interface. The wMobile product is a web-based client for GoldMine based CRM systems. Users access wMobile from their desktop computer, tablet or phone. wMobile enables GoldMine users to access the functionality of GoldMine in a lightweight web client. With over 20yrs of best-practice designs built-in, AdmitGold is the ideal, affordable solution for all your higher education enrollment needs. With AdmitGold’s well organized and easy to navigate admission template, recruiters and directors alike will have access to all the information they need about prospective students and the enrollment funnel, right at their fingertips. Contact information, admissions status, and complete application tracking is available quickly and easily. Now the power and functionality that was only accessible to Higher-Ed is now available for K-12 institutions. AdmitGold K-12 includes all the features of AdmitGold while meeting the unique needs of primary education. With over 15yrs of best-practice designs built-in, DonorGold is the ideal, affordable solution for any non-profit organization. Manage your entire constituent ecosystem, from constituents to vendors, volunteers to sponsors. With DonorGold’s well organized and easy to navigate donor management template, gift officers and directors alike will have access to all the information they need, right at their fingertips. Increase sales productivity with ConnectLeader Sales Acceleration Platform for GoldMine CRM users. Our Intelligent Sales Acceleration platform gives sales, lead generation, and marketing teams powerful tools to identify the right prospects, obtain accurate contact data, and enable accelerated communication using our sales connectivity optimization and lead nurturing solutions. Dramatically improves call pickup rates with local caller id. Users can upload their contacts from one or more GoldMine filters to dial. Reach your best Leads first using Adaptilytics. Complete visibility and control of the dialing process. Record and Deliver voice messages. Record, Listen and Grade your calls at any time. Managers can coach live or offline using Remote Coach. Provides instant feedback through Dashboards and Analytics. Mitel Phone Manager for Mitel MiVoice office 250 (part of the MiVO Application suite) offers GoldMine users a level of integration that delivers operational efficiencies which quickly translate into improvements in customer service levels. Dial OUT from GoldMine through 3CX using the GUI or keyboard shortcuts. · “Pop” (display) the GoldMine record of an INBOUND caller based on CallerID. Searches Primary and Additional Contacts. · Automatically create a history record for each call. · If you use 3CX for recording calls, create a link in GoldMine to the recording file. · Dial quickly and accurately—save time, avoid mistakes. · Makes it easy to create a record of every call. · The link to the recording of a specific call is much easier than wading through a huge folder of recording, hunting for a specific date and time. Tapi Link for GoldMine enables users to automatically make outbound calls directly from within GoldMine. For inbound calls, it will automatically present the caller’s contact details as the phone rings (screen-popping). For incoming calls it searches ALL telephone numbers including those of all Additional Contacts. If you have the callers number listed in GoldMine, Tapi Link will present their information automatically. And if it’s an entirely new caller or new number, Tapi Link can create and capture that information into an existing or brand new contact record. Power Dialer for GoldMine is the scalable, cost-effective alternative to a predictive dialer. It enables GoldMine users to work through their telephone calls quickly and automatically, using either calls scheduled in the user’s activity list or calls based on an active GoldMine filter or group. Power Dialer becomes an integral part of GoldMine, achieving maximum productivity by enabling users to rapidly acquire call lists and progressively dial and connect all calls swiftly and automatically. Smart Survey captures information from prospects and customers by providing a survey solution integrated with GoldMine. 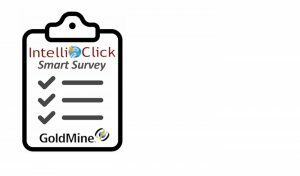 Surveys can be triggered based upon actions and results tracked in your GoldMine system or they can be sent to any segment of your database. Results are instantly added to a special Survey tab added to your GoldMine system within seconds of a survey being completed and seamless integration means no upload or download of data is required. Work flow automation can also be triggered by a survey, allowing you to leverage other GoldMine features for survey follow-up or alerts based upon results received. More information is available at www.intelliclicksoftware.com/smartsurvey.html. Constant Contact, the leader in email marketing, offers integration with GoldMine. With Constant Contact you get a powerful way to take your email marketing to a new level with targeted emails, detailed campaign reports and the ability to build segmented lists combined with GoldMine all make for a robost platform. Try Constant Contact for free today. Click tracking and website navigation that provides real-time GoldMine CRM integration for email marketing campaigns. Automated Nurturing of Investors -Investment Gold is the ultimate client care system for wealth management professionals. In use at more than 8,000 offices across the U.S. and Canada, it transforms GoldMine into a proactive system for nurturing your clients and prospects. Investment Gold detects when someone is due for service and automatically schedules the appropriate actions to the correct members of your team. As a result, investors receive a customized level of care. For more information, call (519)747-2370 or visit www.chaffemalcolm.com. Summit Funding Group offers 100% financing for your GoldMine Software solution. CompanionLink provides data synchronization from GoldMine to Android, iPhone, iPad, Windows Phone and BlackBerry phones and tablets. Also syncs with Gmail and Google Apps. Two-way sync of contacts, calendar activities, to-dos, notes and histories. GoldMine data works with built-in device features like Caller ID and email. Linked Systems for GoldMine® – Linked Systems provides integration between GoldMine® and Microsoft Dynamics GP® (Great Plains). Riva CRM Integration syncs GoldMine directly to your email server. Office 365, Microsoft Exchange, Gmail/Google Apps, IBM Notes/Verse or GroupWise. Riva syncs contacts, calendar activities, tasks and email in the background – without installing any email client plug-ins or mobile apps. Compatible with all Office 365, Exchange, Gmail, Notes/Verse and GroupWise clients and mobile devices including: Outlook 2016 – 2003, Outlook Web Access (OWA) and Web Mail App, Outlook on Citrix, Outlook for Mac, Apple Mail, and all mobile devices: iPad, iPhone, Android, Surface, Windows mobile and BlackBerry devices. Gmail compatibility includes support for all desktop browsers (including Linux and Mac) and all mobile devices configured to communicate with Gmail. Join the thousands of CRM users – from SMBs to Fortune 500 companies – who use Riva to sell more, sync more, and save more time. Contact Riva at 408.675.5015 or visit the websitewww.rivacrmintegration.com for more information. Riva On-Premise is licensed at $175/user with volume pricing available for 30 or more users. Riva Cloud licenses start at $9.95/user/per month. Integration and Migration for GoldMine – Inaport is a full featured integration and migration product with specialized functionality to support GoldMine cloud and on premise. GoldMine Integration – Get more from your CRM investment. Move any data to and from GoldMine quickly and easily with Inaport. Rapid, code free development; no seat count restrictions. GoldMine Migration – No-risk migration to a new CRM. Inaport’s free migration maps and strong matching ensure fast, flexible and complete transfer of legacy client details to GoldMine. Contact us directly at +1-949-784-0708 +44 (0)800-029-1302 or learn more on our website. Save money and let employees and customers use your mission-critical Windows applications from anywhere. Since 1999, GO-Global has provided large and small businesses with reliable, secure, multi-user access to Windows applications from any location, device, and operating system. Unlike Citrix XenApp and Microsoft Remote Desktop Services, GO-Global can be installed and configured in 15 minutes on any Windows PC or server. And unlike TeamViewer and LogMeIn, GO-Global lets multiple users run applications on a single Windows computer at the same time. QuoteWerks enables companies to create detailed quotes and proposals with speed and efficiency. QuoteWerks is a turn-key quoting and proposal solution with over 80,000 Users in 101 countries. Whether your company is a small 1-person company or a large Fortune 100 company, you can benefit from the increase in productivity QuoteWerks provides. Pricing starts at $199. Call 407-248-1481 or visit the website for more information. An intuitive report writing, query, and data mining tool designed specifically for GoldMine. Stonefield Query for GoldMine provides a step-by-step method to create professional business reports from information stored in GoldMine. Anyone can create detailed reports, high level overview, drill-down, charts/graphs, pivot tables, and more in minutes rather than hours. Call 1-800-563-1119, email [email protected], or visit the website for more information, including a free trial version. MasterMine for GoldMine – Excel-based, user-friendly reporting and data management. The easiest reporting for GoldMine, plus analysis, data manipulation, and mass updating—all in one, tight GoldMine integration. A must-have for serious GoldMine managers. Pricing starts at $995. Call 877-877-7212 / 651-917-5010 or visit the website for more information. GoldVisionPro is a full-featured and state-of-the-art Enterprise Content/Document Management System, completely within your GoldMine database. Automatically handles files from every application, from scanning to automated file processing; unlimited custom indexing to data-mining your documents. In addition, GoldVisionPro now also provides Intelli-Note, the versatile, real-time workspace with one-key access to all your GoldMine data and text. Call 480-222-0577, or visit the website for more information. Scanner Plus provides simple highly integrating scanning into GoldMine. Scans with a couple of clicks and links scans to the current GoldMine record. Optionally notifies a GoldMine user, crop and rotates. Supports automatic feeders and double side scanning if the TWAIN driver supports it. Visit the web site for more information and for free evaluation download. Print FedEx, UPS and postal shipping labels right from GoldMine contacts. Stop wasting label sheets trying to print one or two labels! KnowledgeSync monitors your CRM (and related) data for critical, time-sensitive conditions; when those conditions occur, KnowledgeSync alerts the right people and auto-responds with intelligent workflow. KnowledgeSync is priced starting at just $1,799 (on prem) or $99/month (subscription) and for that price can monitor an unlimited number of conditions in GoldMine and deliver an unlimited number of alerts (via any device) to an unlimited number of recipients. Visit www.vineyardsoft.com and download the live software for a free 30-day trial or contact us for a demonstration. Having trouble reaching your contacts? That’s because they’re “blanketed” by the nonstop background static of everyday marketing. Poke through the fabric of noise, send your message directly to the hip pocket of the person you really want to reach. GoldSMS gets it done. Send actual SMS messages, not e-mail conversions. All texts are linked to their contact records. Conversation module makes dialog easy. “Blast” module provides broadcast function.